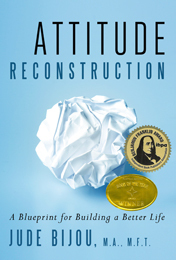 –Attitude Reconstruction proposes that all our problems stem from unexpressed sadness, anger, and fear. –This book offers five complete, ground-breaking approaches in one. Furthermore, it indisputably shows that our emotions, thoughts, intuition, speech, and actions are all governed by the same Ultimate Attitudes: honor yourself, accept people and situations, and stay present and specific. –Author Jude Bijou is uniquely qualified to present this work. Attitude Reconstruction is culmination of a three-decade professional and personal journey as a psychotherapist, teacher, and student of Eastern philosophies. –Emotions — The book demystifies emotions in general and shows how to express sadness, anger, and fear constructively and physically so they don’t overshadow joy, love, and peace. –Thoughts — Readers learn how to identify their predictable and universally held destructive thoughts associated with sadness, anger, and fear and replace them with “reliable truths” that will serve them better. Moreover it shows how to create and internalize constructive thoughts. –Intuition — Intuition is our best source of guidance. Many people complain that they don’t know how to access their intuition and others fear they can’t trust it. Readers are shown a foolproof way to determine what is true for them in their heart-of-hearts. –Speech — The four rules that govern communication allow readers to navigate any kind of situation with ease. 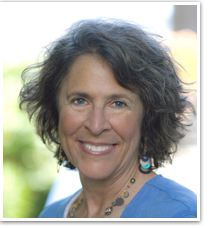 How to speak up loving and effectively, handle communication violations, extend bridges to increase feelings of connection, and resolve differences of any magnitude are also explained. –Action — The book describes how to handle any stuck situation and overcome any destructive habit, whether it is an attitude or an addiction, by creating a goal and translating it into small doable steps. –The material is easily understood and integrated into daily routine, no matter what the reader’s spiritual path, cultural background, or education level. –Numerous examples from the author’s private practice as a licensed marriage and family therapist and teacher are given throughout the book to illustrate how people have successfully implemented these simple principles. –The book contains a comprehensive Blueprint that is a map of the mind. The Blueprint and a self-assessment Quiz allow readers to quickly pinpoint what keeps them mired in unhappiness and discover what brings joy, love, and peace.